This flat bread is a little crumbly and a little crisp. Perfect with a little cheese or a little smoked salmon, creme fraiche and capers for a little snackette. It is packed full of sunflower, sesame and chia seeds so it is even good for you! Packed full of omega 3s Chia seeds were eaten by the Aztecs. They called it "running food" because one teaspoon would apparently give them enough energy to march for 24 hours. This flat bread may not help you march for 24 hours but it is tasty earthy take on bread that will nourish and make you feel a little virtuous and see you through an afternoon until dinner time. Even better they can be whipped up in a matter of minutes. Feel free to add whatever takes your fancy. I am thinking maybe walnuts and olives next time around or perhaps throw in a few pumpkin seeds in to the mix. Preheat your oven to 180C/ 350F and line a baking tray with baking paper. Place both the flours in to a large bowl and add the sugar, salt, baking powder, cayenne pepper and the seeds. Stir together and then add the egg and egg white. Stir well to combine and then turn out the dough on to a floured surface. It will be quite a stiff dough. Knead the dough got a moment or two and then roll it out in to a circle. Roll it out until it is about half a centimetre thick. Cut the circle in to 8 wedges and place them on the lined baking tray. Place in the oven and bake for 10 minutes. After 10 minutes turn the flatbreads over and bake for another 10 minutes until golden and crisp. Remove from the oven and allow them to cool. A tasty and healthy flat bread so what’s not to love? The chickpea flour adds a lovely savouriness and the seeds a welcome crunch. Crunchy, crisp and full of flavour...yum! This is my contribution to this month's Twelve Loaves as Cake Duchess, Life's a Feast & Creative Culinary takes us on a bit of bread baking journey. Now that looks a really interesting texture and flavours sound good. That last photo looks yum! Thanks for joining us in baking for Twelve Loaves; I just love seeing the variations on the theme each month...and well, want to make them! Thanks Barbara, I just picked them up at a local health food store...I tend to see things I have never seen before & can't resist buying them! This looks yum, I could eat it with anything :-). Wow this is a fantastic addition to the Twelve Loaves baking line up! Crackers! I've always wanted to make crackers and these are fabulous! A dash of sweet, a dash of hot and my favorite seeds. And you will never believe me when I tell you I actually have a sack of chickpea flour in my fridge! Bingo! 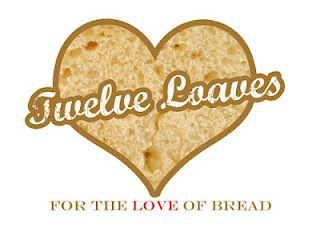 So thrilled you baked along with us for 12 Loaves!